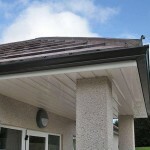 Seamless is a continuous length of guttering. It is rolled out of the back of a gutter forming machine using stainless steel rollers which forms the guttering on site to exact measurements to fit your property. The brackets are concealed inside the gutter and they are not visible to the eye they provide extra strength with the smooth appearance and clean lines making it a perfect choice for traditional or modern properties. 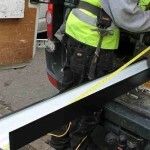 Offers a cost effective and far superior alternative to traditional pre-cut guttering systems. Seamless comes pre painted with a non-corrosive coating and will not need repainting for 25-35 years, no more rusty gutters. Seamless is joint less there for preventing any leaks. Available in 90x102mm for domestic use (100mm being the catchment area). Available in 100x125mm for domestic use (125mm being the catchment area). Available in 125x150mm for domestic, commercial and industrial use (150mm being the catchment area. 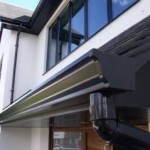 Gutters are mounted using hidden hangers / brackets, so a clean long run is established and is pleasing to the eye. 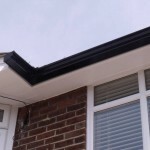 Seamless guttering can be fitted back to all types of fascia’s, brick or stone. Call now on 07999 254992 for a free quotation..
We cover a variety of areas including Burnley, Skipton, Clitheroe, Colne, Barnoldswick, Nelson, Earby and many more surrounding areas. If you are looking for Roofing in Burnley or nearby, no matter how big or small, then look no further than JT Roofing in Burnley.